For the ones interested in historic spots the sindhudurg fort in Malvan a few kilometers from Devbagh is a must visit. Sindhudurg Fort is a famous fort situated near Malvan Jetty in Sindhudurg district of Maharashtra, India. This fort was built by the Maratha King, Shivaji, himself under his supervision and guidance. In fact, this fort was the naval headquarter during the ruler-ship of Marathas. 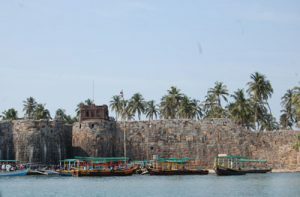 This fort is situated on an islet, Kurte Island and is almost half a km away from the Sindhudurg District’s Malvan Jetty town in the Konkan area of Maharashtra near south of Mumbai and is surrounded by the great Arabian Sea. Sindhudurg Fort itself is the main attraction. Along with the architectural rich fort, there are temples also to visit there which are a big attraction for tourists. These temples are dedicated to Goddess Bhavani, God Hanuman and Jarimari. Along with the holy shrines, there is also a popular temple which is devoted to Shivaji. Apart from fort building and temples, there are 3 sweet water wells and few tanks which are also available in the fort premises. Underwater sports are also available for tourists here. The fort also possesses a coconut tree for which people around the world make a visit here since this is the world’s only coconut tree that has branches and provides fruits. Another fort attraction is an underground tunnel which is supposed to be used by the ladies in case of enemy attack in ancient times. This tunnel, however, was closed partially by the British East India Company. This tunnel, as per legends, goes almost 12 km beneath the Arabian Sea.